Dovie's Famous Burgers and The Monroe County Family Wellness Center. as well as the hospitality and slower paced lifestyle typical of rural Kentucky. although temperatures are moderate year-round. 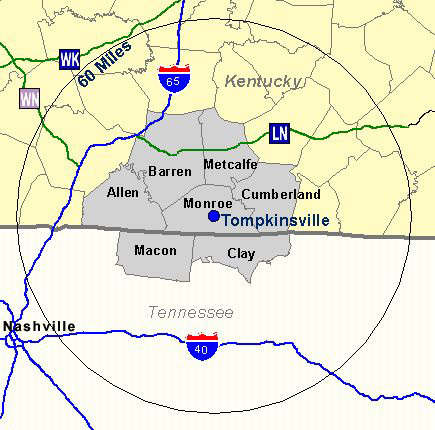 Tompkinsville, the county seat, is located near the center of the county. It was first settled about 1790 and now has a population of almost 2,700.
is located near the headwaters of the Barren River, one mile from the Kentucky-Tennessee border. near the borders of Barren and Allen counties. About 250 people live in Fountain Run. Monroe County is home to several Amish and Mennonite communities where their traditional way of life is still practiced. In most of these areas, crafts and home-grown produce are marketed on site. in addition to tree-covered hills that supply hardwood timber for local lumber and pallet industries. each restaurant with its own barbecue sauce recipe. Specialty restaurants, like our nationally famous "Dovie’s", can be found throughout the county. We hope you enjoy your visit to our county, and invite you to come back whenever you can.